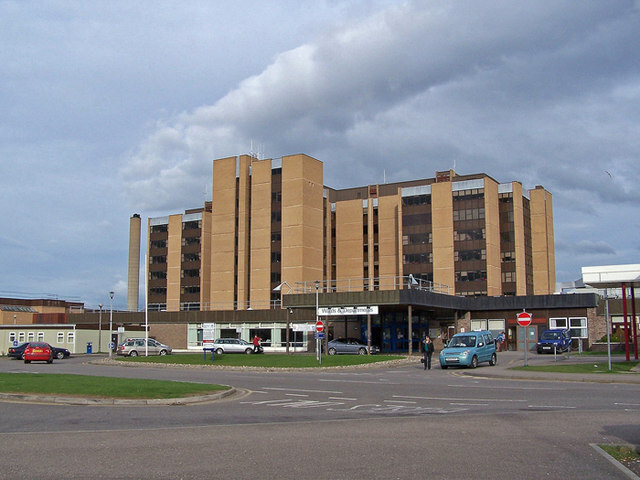 The Outer Hebrides are served by one general hospital in Stornoway on the Island of Lewis – the Western Isles Hospital. It was designed and built by the Common Services Agency and opened to patients in 1992. The hospital was designed to replace two much older hospitals: the Lewis Hospital and the County Hospital. The County Hospital had been built by the Red Cross during the First World War as the Lewis Sanatorium, and after the war was transferred to the local authority. The Lewis Hospital was built in 1893-6 on Goathill Road. Before the advent of the National Health Service, there was also Mossend Fever Hospital, built by Stornoway Town Council in 1876, which contained 12 beds, and the Lewis Combination Poorhouse, opened in 1897, which took in sick paupers and manageable cases of the mentally infirm. In 1904 the Lewis Hospital also contained twelve beds, but its capacity was increased to twenty when the building was enlarged in 1912. A consultant surgeon was appointed in 1924, partly funded by the Scottish Board of Health under the Highlands and Islands Medical Service. A further grant from the Board helped to fund an extension to the hospital that opened in 1928. 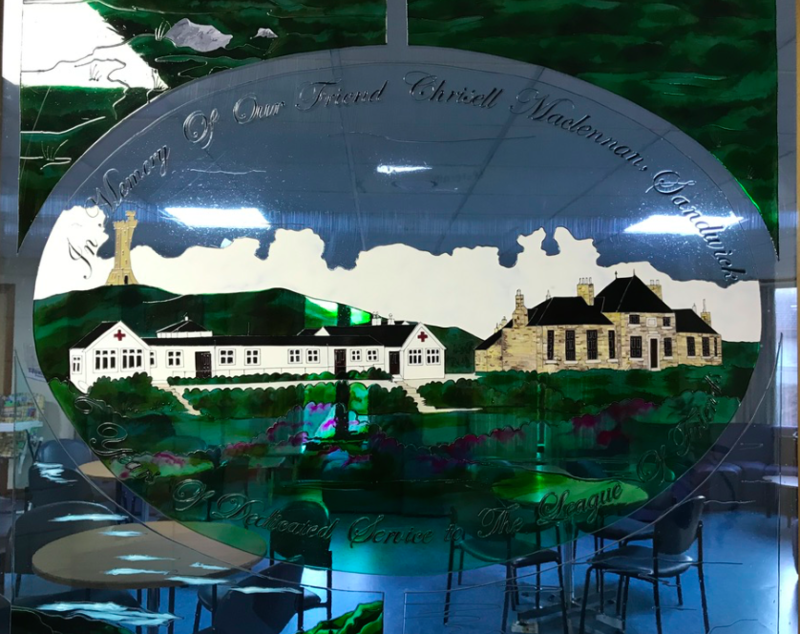 At the time, this was heralded as the first step in the realisation of a perfect hospital service for the Outer Hebrides as envisaged by the Dewar Commission of 1912, which first outlined the Highlands and Islands Medical Service. Seen by many as a precursor of the National Health Service itself, the Service extended state-funding of health care beyond the responsibilities for the care of the destitute sick, the mentally ill and the control of infectious diseases. The works done in the 1920s included improvements to the water and electricity supplies, the installation of central heating to replace peat and coal fires, X-ray plant, a new operating theatre, light treatment – including artificial sunlight treatment – enlarged kitchens and improvements to staff accommodation. This may have been true, but the annual report of the hospital back in 1899 painted a rather different picture; 70 patients had been treated during the past year, of whom only three died. The yearly number of admittances was increasing, most being from the island, but 18 patients were ‘strangers … whose home residence extended from Reikjavik, in Iceland, to Sidmouth, on the Devonshire coast’. Nearly all of these were fishermen or sailors. 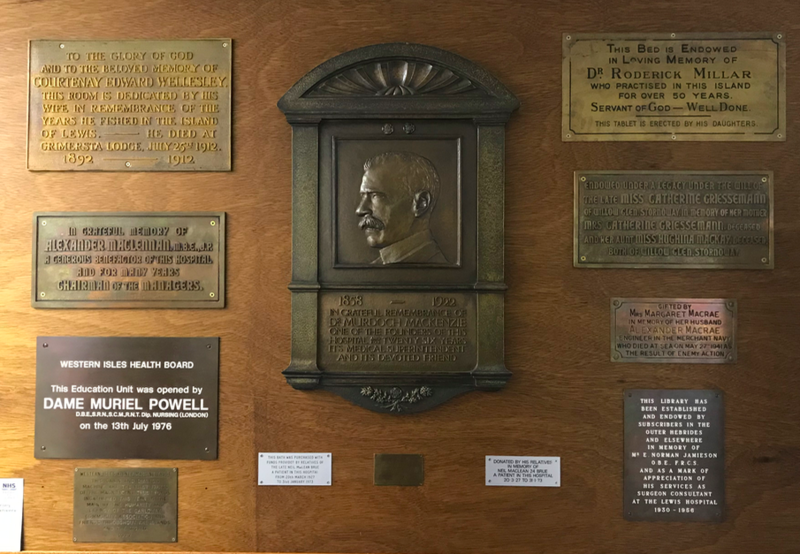 In 1923 fewer than 100 cases were admitted to hospital, but in the following year, after the appointment of the consultant surgeon, 375 patients were treated and 350 operations performed. In 1964 the Secretary of State for Scotland appointed a committee to review the general medical services in the Highlands and Islands. Under the NHS the areas formerly covered by the Highlands and Islands Medical Scheme were now administered by three separate regional hospital boards: the North Eastern, based on Aberdeen, took care of Orkney and Shetland; the Western, based in Glasgow, oversaw the counties of Argyll and Bute; and the Northern, centred on Inverness, took care of everywhere else. The Regional Hospital Boards appointed boards of management to run groups of hospitals (or, in some cases, individual hospitals). The Lews and Harris board of management was responsible for the Lewis and County Hospitals in Stornoway. 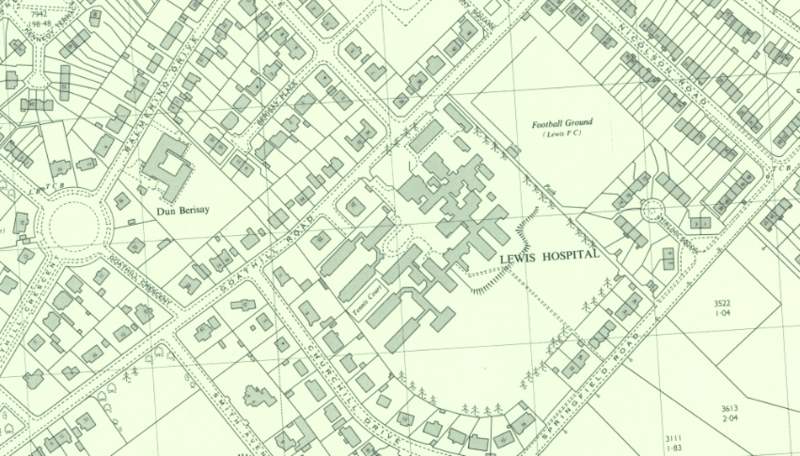 Between 1948 and 1960 around £100,000 was spent on additions to the Lewis Hospital. In 1950 work had begun on a new maternity unit, nursing staff quarters and an out-patient department. In the mid-1960s Lewis Hospital had 83 beds, 46 for general surgery, 24 for general medicine and 13 for maternity cases. the County Hospital had 89 beds, 50 for the chronic sick, 35 for respiratory tuberculosis and four for infectious diseases. By May 1980 the Health Board had drawn up a list of their requirements for the new hospital, suggesting at least 280 beds be provided, comprising 30 medical beds – including provision for infectious diseases and intensive nursing; 48 surgical beds, including 8 for orthopaedic cases, 10 gynaecological beds, 8 for children plus four cots, two for the staff sick bay, 14 maternity, 90 geriatric beds and 30 beds for acute psychiatric patients. The inclusion of beds for psychiatric patients reflected current NHS policy and the terms of the Mental Health (Scotland) Act of 1960 (and the Mental Health Act of 1959 covering England and Wales), . The new network of district general hospitals were to cater for general medical, surgical and psychiatric patients. This policy had evolved from a recognition that the existing mental hospitals did not provide the best environment for new cases. This was in part due to the institutional character of the large Victorian mental hospitals, but also the difficulties of attracting good mental health nursing staff, together with the stigma attached to mental illness in general and the old ‘lunatic asylums’ in particular. 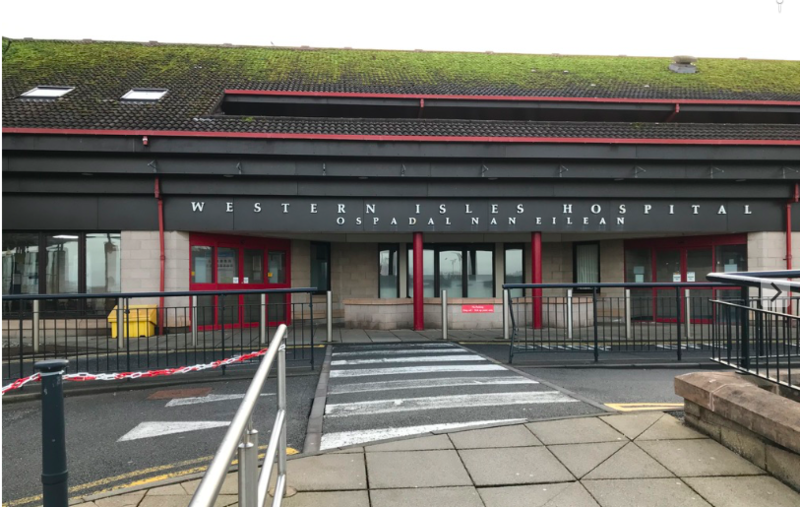 In the Western Isles the problems were exacerbated by the distance to the only psychiatric hospital serving the whole of the Highlands and Islands: Craig Dunain Hospital at Inverness. In 1979 more than 100 patients from the islands were in care at Craig Dunain. The new hospital in Stornoway was therefore to include a psychiatric unit, though links to Craig Dunain were to be retained given the number of specialist psychiatric fields. Netherlea Hospital will soon be no more, and so here is a slightly revised post from 2017. In March 2017 the Dundee Courier announced plans to demolish the former Netherlea Hospital in Newport, Fife, and replace it with a development of luxury houses and flats. Planning permission was granted in August 2018, and work clearing the site was underway in February 2019. The Law Property Group, on behalf of the developers, suggested that the development would be attractive to locals wishing to downsize. But with the upper price of £650,000 this seems disingenuous. A local councillor was quoted as being ‘surprised’ by the proposed price range. On a development promising between 35 and 45 homes, the cheapest property, a two-bed flat, would cost £275,000. Netherlea was built as a domestic villa, for the local shipowner, Andrew Leitch, in about 1893 to designs by the Dundee architect Thomas Martin Cappon. It is a large red sandstone building in simple Tudor style, of two storeys and attics, with stick on half-timbering in the gables. Andrew Leitch was a prominent figure in Dundee, and was particularly associated with the development of the harbour. Born in Fife, he started out as a colliery clerk, later moving to Dundee as the agent for Halbeath Colliery. From there he progressed to being a coal merchant, then exporter, also establishing the Dundee Loch Line Steam Shipping Company. He married in 1859 Isabella Thomson, with whom he had eleven children. She died, at Struan Inn, Banks of Garry, following a carriage accident in July 1897. Andrew Leitch remarried when he was sixty years old in 1902. His second wife, Janet Elizabeth née Smith, became a notable local figure, a supporter of women’s rights, the National Union of Women Workers and many philanthropic causes. She was also the first woman to be elected to the local School Board in Newport. She died in 1913, and her husband outlived her by just three years. In 1917 the contents of the house were auctioned, at that time the house comprised: drawing-room, parlour, dining room, billiard room and hall, 10 bed and dressing-rooms, as well as laundry and kitchen apartments. By 1936 Netherlea was the home of David Hamilton Brackenridge, who, like Leitch, was a member of the Dundee Harbour Trust. Brackenridge was born in Cupar in 1871, and was educated at Madras College, St Andrews, and Dundee High School. He spent 21 years in Calcutta as representative of the Dundee jute merchants, J. C. Duffus & Company. On his return from India he became the local agent for Duffus. He died at Netherlea in January 1939 and a month later his widow had put the house up for sale. The accommodation was listed as comprising: on the ground floor, four public rooms, billiard room, cloakroom and lavatory, kitchen and usual offices; on the first floor, five bedrooms, two bathrooms and maids’ sitting-room and bathroom; on the second floor, three maids’ bedrooms and box room. It also had a modern garage, greenhouse and outhouses, was in excellent condition, electrically fitted throughout, and the grounds tastefully laid out. Although officially opened on 21 July 1948, by the end of September it had yet to admit any expectant mothers. 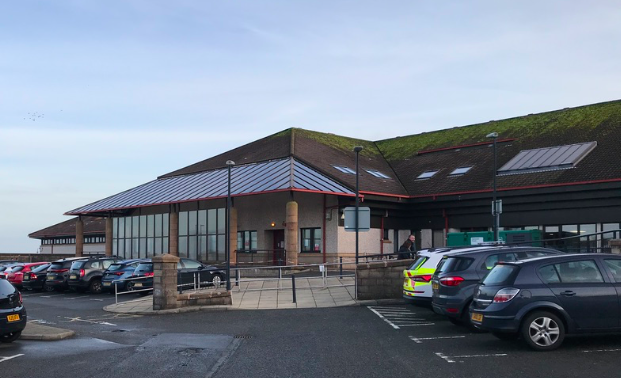 Lieutenant Colonel Noel Baxter of New Gilston, the county convenor for the East Fife Hospital Group Board of Management, visited the hospital expecting it to be up and running and was shocked to find this was not the case. Although Netherlea had a doctor, matron and nursing staff, it could not open to patients because there was no cook. Until one could be appointed, patients were being sent to Dundee, Perthshire or even Edinburgh – ‘all over the shop’ according to the County Medical Officer of Health. It opened not very long afterwards, presumably once a suitable cook had been found. In 1974 Netherlea became a long-stay hospital for the elderly. Designated a community hospital in 1997, it closed in 2011. Since then it has been boarded up and its condition steadily deteriorated. There were some who wished to see the building retained, but despite its significance in the local history of the area, it will soon be demolished. As convalescent homes were not strictly speaking medical buildings, and most of the patients sent to convalescence were able to get up during the day, many were established in private houses which required little alteration to fit them to their purpose. If they proved popular and were well supported, they might be replaced by a purpose-built establishment. Location was important, somewhere where the patients could benefit from clean air away from the cities or towns where they were likely to have been living. Many general hospitals set up convalescent homes in the surrounding countryside or by the sea. Others were independent, but both types were run as charitable ventures, supported by donations, subscriptions and fund-raising events. Charnwood Lodge, near Loughborough, is now a residential home for people with autism and complex behaviour run by Priory Adult Care, but it was originally built as a convalescent home. The foundation stone of was laid on 2 August 1893 by the Duchess of Rutland, and the home was designed by local Loughborough architect, George H. Barrowcliff. A convalescent home for Loughborough patients had first been established in rented rooms in a cottage at Woodhouse Eaves in 1875. Its success led to the opening of a second convalescent home in 1879, intended for Leicester patients. The two homes were merged in 1883 from which time they were officially known as Charnwood Forest Convalescent Homes. The building is situated on the west side of the Buck Hill road, in the heart of Charnwood Forest, being midway between Nanpantan and Woodhouse, … It is sheltered by the Outwoods from the east, by the rough rising rocks known as Easom’s Piece from the west, and by the rising ground at the rear on the north. This site, selected by the committee after most careful consideration, contains an area of four acres, a part of which is covered by a spinney, and it is proposed that the remainder shall be laid out as ornamental grounds. The building, which is of a domestic character, is being erected of the local forest stone, and faced with red sand faced bricks to the doors, windows and corners, and with a brick lining on the inner side, all the external walls to the main building being erected with a two-inch cavity between the stonework and the inner lining. On the front of the building a verandah 7ft 6in wide runs the entire length. This is partly covered with glass, so as not to diminish the light in the rooms. The building will consist of ground, first and second floors, with a spacious corridor running the entire length of each. The entrance hall is approached from the centre of the verandah, and will be available as a committee-room or for the patients to receive their friends, and is divided from the men’s and women’s corridors by swing doors. The remainder of the front consists of three sitting rooms … and a matron’s room 16ft by 13ft. The back portion of the main building ground floor consists of dining hall, … capable of seating 56 persons; sitting room, … china and store rooms. Main staircases at either end lead to the men’s and women’s bedrooms. At the rear are kitchen … scullery, larder, and other offices opening into large paved yard, at the side of which a coach-house is being erected. Suitable lavatory accommodation, lined with white glazed bricks, and isolated from the main buildings, is provided for both sexes at either end of the building. The ventilation and sanitary arrangements are as perfect as can be attained. … The house is designed for 45 patients, and for the entire separation of the sexes except when taking meals, when they will meet in the common dining hall. The sitting and bedrooms will be heated by open fire grates, and the corridors and dining hall by hot water. … The architect after careful consideration has selected the Brindle tile for the roofs from Mr J. Peake, Tunstall bricks for facings from Messrs Tucker and Son of Loughborough, the stone from Messrs. Brabble & Co. Farley Darley Dale quarry. The cost of the structure complete including purchase of land, water supply furnishing etc will be about £6, 000, and the contract is being carried out by Messrs W. Moss & Son of Loughborough, under the direction of the architect, Mr George H. Barrowcliff, of Loughborough. The home was formally opened by the Duke of Rutland in 1894, and in 1896 a lodge was added to accommodate the gardener who also acted as caretaker to the home while it was closed over the winter. Detail of the postcard, showing a group of convalescents posing in front of the building. Although the bedrooms of the men and women were separated in the home, they were able to mix at meal times. Patients were allowed to entertain visitors, and musical entertainments were sometimes put on. There is a suggestion that early on some of the convalescents may have enjoyed their stay rather too much. At the annual meeting of the management committee one of the members, a Mrs Edwin de Lisle, moved that the rules of the home be amended to exclude ‘persons of intemperate habits’. She thought patients ought to be prevented from getting more intoxicating liquors than was sometimes good for them. Following the outbreak of the Boer War in 1899 the management committee offered the War Office the use of the home during the winter months for wounded soldiers, though whether the offer was taken up is not clear. Wounded soldiers were accommodated during the First World War, mostly transferred from larger war time hospitals – such as the 5th Northern Hospital at Leicester. In 1900 a new building was erected as a children’s convalescent home to replace the small house in Maplewell Road at Woodhouse Eaves. This was entirely funded by the Revd W. H. Cooper of Burleigh Hall, Loughborough, in memory of his wife and was named the Cooper Memorial home for children. It was built on Brand Hill, at the upper corner of Hunger Hill Wood, at Woodhouse Eaves, a well wooded site with fine views on the estate of Mrs Perry Herrick. The home, originally built to house 26 children, was designed by Barrowcliff and Allcock in conjunction with Alfred W. N. Burder. Moss & Sons of Loughborough were the building contractors, and the heating and ventilation were provided by Messenger & Co. Ltd. It provided two large day rooms, one a dining-room the other a play room, sitting rooms for the matron and nurses, and four wards upstairs for the children, one of which was arranged as an isolation ward with nurse’s bedroom attached. A brass memorial plaque was placed in the entrance hall commemorating the home’s benefactor and his late wife. Both homes continued in use up until the 1950s, the independent charity continuing after the inception of the National Health Service. The Children’s home was sold to the Church of England Children’s Society in 1987, and two years later was converted into a home for the elderly. It is now called Charnwood House, and has been converted into private flats. The old buildings of Glasgow Royal Infirmary have long since been demolished. It was there that Joseph Lister pioneered antiseptic surgery in the 1860s. But by then the original part of the infirmary designed by Robert Adam was seventy years old, and had been added to and extended many times. In comparison with the other Scottish infirmaries which were in existence by the end of the eighteenth century, such as those at Aberdeen or Dumfries, Adam’s design for the Glasgow infirmary was far more ambitious and its impressive principal elevation was a dignified expression of civic pride. Its grandeur and the choice of architect suggest a degree of one-upmanship. However, Robert Adam was not the infirmary managers’ first choice and he was only brought in, almost by chance, following the death of the first appointed architect, William Blackburn. Blackburn had made his name in London when he won a competition to design a national prison in 1782. He became best known as a prison architect, but he was also surveyor to both St Thomas’s and Guy’s hospitals in London. Michael Port succinctly captures Blackburn’s character: ‘Corpulent in figure, medium in height, Presbyterian in religion, Blackburn was noted … for his candour and modesty’. Blackburn was on his way to Glasgow to discuss a new goal there when he died suddenly at Preston, Lancashire. Many of his uncompleted works were taken over by his brother-in-law, William Hobson, but Hobson would not take on the infirmary commission. Fortuitously, Robert Adam was in Glasgow around this time overseeing the construction of the Trades House, in Glassford Street, and was conveniently placed to step into Blackburn’s shoes. As Glasgow grew and found prosperity in the late eighteenth century, the need for an infirmary became pressing. There was the Town’s Hospital on the banks of the Clyde, but there may well have been a desire to have an infirmary closer to the University, the college buildings at this time were near to Cathedral. Amongst those who came together to found the hospital, two key figures were George Jardine, lecturer in Logic and Alexander Stevenson, Professor of Medicine at the university. Support also came from the city’s leading merchants, merchant and trade guilds, and the Faculty of Physicians and Surgeons. The first meeting of subscribers to the new institution was held in June 1787. By the end of December estimates were being advertised for the building tradesmen. In February 1792 the Infirmary received its Royal Charter, but in early March Robert Adam died, leaving his younger brother James to continue as architect to the Infirmary. The building contract was awarded to Morrison and Burns, on their estimate of £7,900 and the foundation stone was laid with full Masonic honours in May. Detail of Fleming’s map of Glasgow of 1807 showing the original extent of the infirmary and its proximity to the cathedral. Note also the circular area in front of the infirmary, which was part of Adam’s original design. Reproduced by permission of the National Library of Scotland. Death continued to shadow the new building as James Adam died in 1794, the year that the first patients were admitted: an ironic echo of Edinburgh’s Royal Infirmary, where William Adam had died in 1748, the year that his infirmary building was completed. When the Glasgow infirmary first opened, not all the wards were furnished, and the second report makes it clear that other parts of the hospital were not exactly finished. In 1796 money was spent on conducting water from the Monkland canal by lead pipes, making a reservoir and erecting cisterns. Hot and cold baths were installed, a high stone wall around the grounds behind the infirmary and laying out a kitchen garden there, as well as furnishing new wards, rooms for the physician, clerk and house surgeon. Raphael Tuck & Sons postcard, showing the Royal Infirmary to the left of the cathedral. The end result did not lack the flair that one would expect from Adam. The Scots Magazine in 1809 described it as magnificent, and grandly, if not entirely accurately, claimed that ‘Its front has some resemblance to the Hôtel des Invalides in Paris’. The main façade was symmetrical with a broad, central entrance bay which was slightly advanced with canted returns. Above the entrance a typical Adam-style arched tripartite window was set within a pediment carried on coupled columns. A dome was placed at the centre, with its drum ornamented with carved swags. The only other infirmary to come near to this in richness was Gillespie Graham’s Grays Hospital in Elgin of 1815. The internal arrangements of the infirmary were not dissimilar to William Adam’s Edinburgh infirmary, though in Glasgow the building was one single range rather than the U-shaped plan in Edinburgh. On the ground floor were single cells for ‘lunatics’, and on the upper floors the wards took up the full width of the building and had opposing windows. There were separate stairs to access the wards at each end of the block, allowing for a seemly segregation of male and female patients, as well as separate access for the operating theatre, which, like Edinburgh’s was at the top of the building under the dome with ample seating for students. The 1809 Scots Magazine account was by Dr Joseph Frank who had been shown round the hospital in 1803. He noted that there were eight wards or sick rooms, two on each floor, ‘besides one underground’. The wards had twelve beds in each, standing ‘two and two in the spaces between the windows, quite close to each other’. Ground plan of the infirmary in 1832, the original building to the left, with the wing added in 1814-15, is to the left, and the fever block to the right. Reproduced from M. S. Buchanan, The History of Glasgow Royal Infirmary…, 1832. The entrance led into a handsome porch, but he was less impressed by the rooms in the basement, the kitchen (disgustingly dirty), pantry (in bad order), laboratory (so narrow that there was scarcely room to turn around in it), apothecary’s shop (small and dark) and the warm and cold baths (the cold bath small and damp). For patients who were too weak to be able to use these baths, there were tin-plate bath tubs, which could be brought to their bedside. These had ‘the appearance of a shoe’. Quite how the the patients managed to get in or out of these contraptions puzzled the writer. One of the Glasgow infirmary’s first physicians, Robert Cleghorn, called attention to the superior quality of the sanitary facilities, with water-closets even on the upper floor, and the use of iron bedsteads, rather than the wooden cubicles at Edinburgh. Up-to-date literature on hospitals was influential in the design, including the work of Jacques Tenon who had made a tour of hospitals and prisons in England in the 1780s for the Académie des Sciences in Paris. The report and plans produced by the Académie in 1788 had been supplied to Adam by Cleghorn himself. There are at least superficial parallels between the ward pavilions in the Académie’s plan for the Hotel Dieu in Paris and Adam’s upper-floor plans. In both the end bay contain stairs and ancillary rooms, and project forward from the central part of the range. The centre area is about 42 feet in circumference, and rising in a circular form all around this surgical, and clinical arena, may be remarked five ranges of high-backed steep benches, for the accommodation of at least 200 individuals. The whole of this splendid and commodious operating theatre is crowned by the large central dome … whose vertical lattices, descending to a considerable depth, thus throw the light to great advantage on the table of the operator. This beautiful termination to the edifice, which rises to the height of about 35 feet above the floor of the operation room is supported on twelve chaste pillars of the Ionic order, and by this means, as in the construction of all the other parts of the building, convenience, simplicity, and elegance, are seen mutually to harmonise and assist each other. The first addition to the infirmary was a wing projecting north from the central bays, added in 1814-15. This provided a staff dining-room, accommodation for female servants, and additional wards for about 80 patients. Each ward had a nurse’s room and water-closet and communicated with the kitchen, apothecary’s shop, mortuary etc. in the main building. A detached block to the north-east of the main building designed as a fever hospital was built in 1828-9, designed by George Murray, architect. View of the Royal Infirmary from the north west, with the fever hospital to the left. Reproduced from M. S. Buchanan, The History of Glasgow Royal Infirmary…, 1832. Dealing with outbreaks of infectious diseases in the rapidly expanding, and increasingly overcrowded city, was one of the main challenges for the infirmary managers. The addition of a separate fever hospital had been anticipated for some years, but funds had not been forthcoming. As the need became more acute, first rented accommodation was used and then a temporary ‘shed’ put up in the grounds. The original plans for the new block were to provide 220 beds at a cost of £2,900. But with rising building costs, these were scaled back to provide 120 beds. During later epidemics temporary accommodation had again to be found. 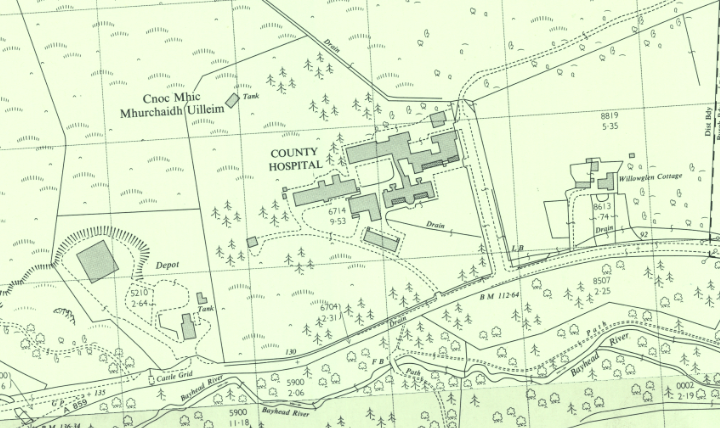 By about 1842 the detached fever hospital had been linked to the main infirmary by a further wing, shown on the OS map below. It contained a large clinical lecture room, waiting room, dispensary, inspection room and a pathological museum. David Hamilton designed a west extension built c.1839, but more research is needed to discover whether he also designed the block on the east side. Extract from the OS large-scale Town Plans, 1857. This shows the extent of the infirmary prior to the addition of the surgical wing on the north side, which was built a little to the north of the wing shown on this map labelled ‘wards’. Reproduced by permission of the National Library of Scotland. Around 1859 work began on the third major addition to the site: the Surgical Hospital. The additional accommodation had been under discussion for some ten to fifteen years, with opinions divided as to whether the original hospital should be further extended or a new one built in a less overcrowded part of the city. A major consideration in remaining on the spot was that a third of the infirmary’s patients came from the old city districts in the immediate vicinity, the remainder fairly evenly from the city suburbs and more distant parts of Scotland. Typical floor plan of the new surgical hospital, from the Proceedings at the Opening of the New Surgical Hospital of the Glasgow Royal Infirmary…, Glasgow, 1861. Plans for the new surgical wing were prepared by the architect William Clarke of Clarke and Bell. It was completed in 1861, and formally opened in May. The contractors were Mr Brownlie, mason, Messrs Lamb & Rankin, wrights, Mr Dalron, plaster work, and Mr Moffat was the clerk of works. Designed in accordance with the ‘most approved modern theories of hospital architecture’, it was an early example in Scotland of the pavilion plan, with two ward wings placed in line on either side of a central block containing the main staircase. Nurses’ rooms, sculleries, side rooms, bath rooms, water closets, and a hoist for raising and lowering patients were all placed at the extremities of the wards, while the wards themselves had opposed windows – seven on each side – destined for 24 patients, but in the first instance fitted up for a more comfortable 16. The operating theatre was, as before, at the top of the building in the centre. It was arranged in a horse-shoe shape and had tiered seats for 214 persons. Aerial Perspective of the Royal Infirmary, with the new surgical wing to the rear, and the fever hospital to the right, from the Proceedings at the Opening of the New Surgical Hospital of the Glasgow Royal Infirmary…, Glasgow, 1861. Ventilation and heating were key concerns in the design of large public buildings in the Victorian era. Glasgow Royal Infirmary’s superintendent, Dr McGhie, published an article in the Glasgow Medical Journal in January 1861 on the site and construction of hospitals with particular reference to the Royal in which these themes were fully explored. The new Surgical Hospital was heated by open fires, two per ward placed back-to-back, roughly in the centre of the ward. Vitiated air was carried away through a shaft containing two smoke flues and one ventilating flue for each ward except the top floor which was ventilated by four circular openings in the ceiling. An experimental heating system was fitted in one of the wards which had a heated chamber at the back of the fires into which fresh air from outside was warmed before passing into the ward. Another innovation in the surgical wing was the provision of a day room on each floor for the benefit of convalescent patients. With three windows facing northwards, each day room was equipped with tables, books and ‘other means of amusement’. David Smith, the chairman of the building committee, pushed for this inclusion, arguing that recovery was facilitated by removing the patients from ‘moribund patients in the same ward’. Convalescents could also benefit from the pleasure ground laid out to the north of the new building. An acre in extent it was laid out in three terraces from a design by Mr Clarke of the Botanic Gardens. A verandah was built at the upper end of the ground, 150ft by 10ft for shade and shelter. Extract from the OS Town Plan of Glasgow, 1892-4. Reproduced by permission of the National Library of Scotland. In 1887-8 a nurses’ home was built to designs by J. Baird and J. Thomson.The contractors were Alex. Muir & Sons, masons; Anderson & Henderson, wrights; Wm Davie, slater; Brown & Young, plumbers and Alex. Brown, plasterwork. The new home was markedly more comfortable than the previous accommodation, and was aimed at attracting a ‘superior class of nurses’. Situated well away from the main infirmary complex, this four storey building had views to the south over the Necropolis and the Cathedral, but was linked to the surgical wing by a covered way some 180ft long and 15ft wide with an arched roof of glass and heating so that it could double as an amenity for convalescent patients. The Home itself had 85 nurses’ bedrooms, rooms for the superintendents, bathrooms, and a large recreation room. There was a box room to stow the nurses belongings, a wide and airy staircase ‘almost elegantly finished’. Heating was primarily by hot-water pipes, with fireplaces only in the superintendents’ rooms, and ventilation was by Tobin’s tubes. At the back of the building a tennis court was laid out: the infirmary’s Superintendent, Dr Thomas, believed strongly in the game of tennis as a ‘health-giving exercise’. Extract from the 25-inch OS map of Glasgow, surveyed in 1892-3. Reproduced by permission of the National Library of Scotland. As the nineteenth century drew to a close, the condition of the older infirmary buildings became an increasing source of concern. 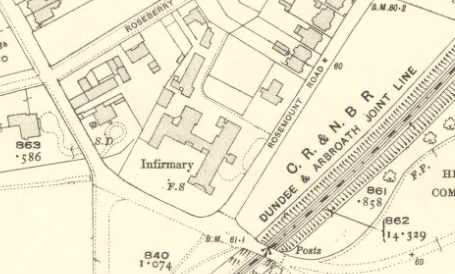 There was a general consensus that the oldest blocks needed to be replaced, but much disagreement as to whether the infirmary should be rebuilt on a new site – as had the Edinburgh Royal Infirmary in the 1870s – or on its existing site. Queen Victoria’s jubilee in 1897 prompted the Lord Provost of Glasgow to launch a campaign to rebuild the infirmary to commemorate the Queen’s long reign. Those in favour of remaining on the the original site won the day, and over the next seventeen years the new infirmary was constructed. The map above shows the site as it was before reconstruction, the two below are from 1910, part way through the rebuilding, and 1933, when it had been completed. Extract from the 25-inch OS map of Glasgow, surveyed in 1910. Reproduced by permission of the National Library of Scotland. Extract from the 25-inch OS map of Glasgow, surveyed in 1933. Reproduced by permission of the National Library of Scotland. quoted from Michael Port’s entry on William Blackburn in the Oxford Dictionary of National Biography, accessed online.